I shared this list last year, but I think it is just as important today! Be sure to click on the links for more information about each! 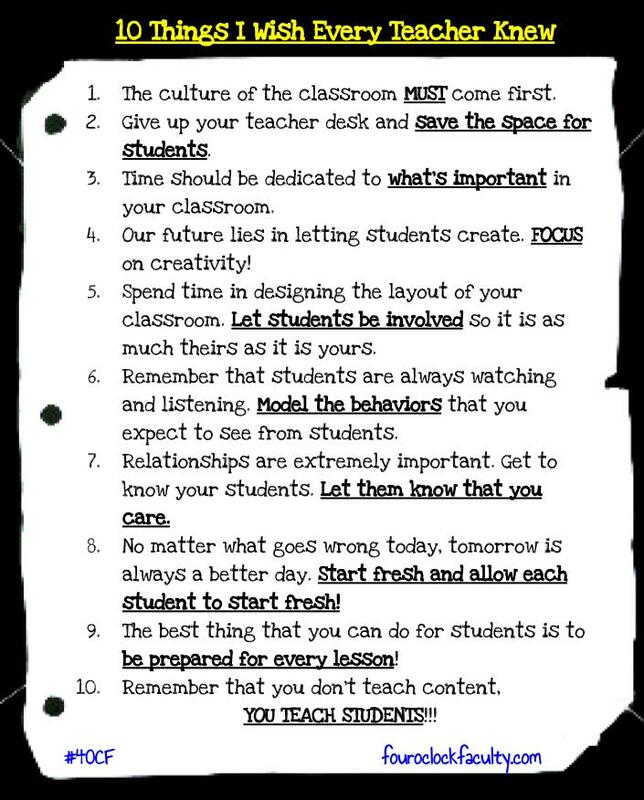 The culture of the classroom MUST come first. Teacher desks are overrated. Give up the desk and save the space for students. Time should be dedicated to what’s important in your classroom. Our future lies in letting students create. FOCUS on creativity! Spend time in designing the layout of your classroom. Let students be involved so it is as much theirs as it is yours. Remember that students are always watching and listening. Model the behaviors that you expect to see from students. Relationships are extremely important. Get to know your students. Let them know that you care. No matter what goes wrong today, tomorrow is always a better day. Start fresh and allow each student to start fresh! The best thing that you can do for students is to be prepared for every lesson! Remember that you don’t teach content, YOU TEACH STUDENTS.